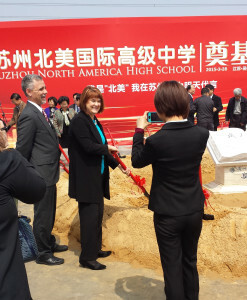 When Dr. Hiller Spires participated in the groundbreaking ceremony for the Suzhou North America (SNA) High School in Suzhou, China, she built a bridge connecting North Carolina to China that will allow future students from both countries to learn in new and innovative ways thanks to the cultural exchanges that will be made possible through this exciting international partnership. There are already 40 students and 10 teachers attending and teaching at SNA, which is currently being held in a rented space. Spires, senior research fellow and professor at the Friday Institute for Educational Innovation at NC State, attended the groundbreaking ceremony on Mar. 28, and the school is expected to be complete in August 2016. Their temporary location has not stopped them from participating in innovative approaches to education. 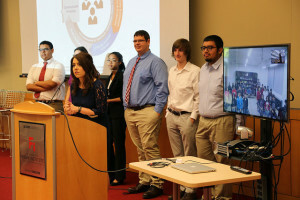 In April, the students from SNA virtually presented video projects they had collaborated on with students from Wake STEM Early College (ECHS) High School at NC State as a part of Spires’ Project-Based Inquiry Global. “Rather than talk about being partners, we decided to jump right in and engage the teachers and students in a collaborative inquiry project,” said Spires. Click here to watch a short video to hear from the ECHS and SNA students and teachers themselves about the project. The two-year, $1.5 million project, officially titled “Suzhou North America High School: Connecting to the Future,” is funded by the Wuzhong Group, a real estate development firm in China, in partnership with Jiangsu Province Educational Excellence Foundation. The new school is intended to educate students who plan to enroll in top U.S. universities, with a curriculum that incorporates creative thinking and problem-solving skills that the American education system emphasizes, but which is not a widespread practice in China. Approached to be a creative partner on the project, Spires and her team are helping design the school, including a rigorous and global curriculum, dynamic pedagogies, emerging technologies, and collaborative learning spaces. 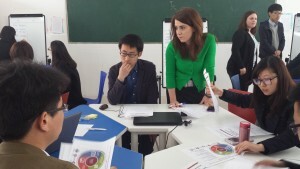 On her most recent visit to China, Spires and her team conducted workshops and feedback sessions on the first iteration of the curriculum design with the teachers at SNA. While students from both high schools will continue to collaborate on future projects together, a student exchange program will be implemented once SNA is built, allowing some students from both schools the opportunity to travel and meet the peers they will have worked with virtually in person. The high school students will not be the only ones traveling to learn. Students from NC State’s College of Education will have opportunities to conduct part of their student teaching requirement at SNA. Additionally, veteran teachers from North Carolina may travel to China to learn about Chinese culture and education with the educators at SNA, and then return to reinvest that global knowledge in NC classrooms. “North Carolina has a long history of focusing on the importance of global education. This strategic partnership with Suzhou will lead to development of personal and professional relationships that can lead to academic collaboration. This collaboration among nations is the path to solving complex challenges that face our world,” said Tricia Willoughby, NC State Board of Education member. Spires began developing the model for Project-Based Inquiry (PBI) over a decade ago in one of her graduate classes, and has used it as a centerpiece pedagogy in the New Literacies & Teacher Leader Institutes since 2009. She is now applying the process to her work with SNA. The PBI process effectively allows students to collaborate with peers from other countries and learn about other cultures as they collectively learn new information. “We went through a very intense process where we tried out the different iterations of our inquiry model,” said Spires. “The cross-cultural context makes the process more interesting and challenging because you have students from two different cultures who are working collaboratively to create a compelling question, gather data from a variety of sources, creatively synthesize the information, and then co-construct a final product online to share globally. The students from ECHS and SNA used WeChat, Skype, Animoto, iMovie and other communication and creative production applications in order to collaborate on their projects, which were videos that answered a question the students developed based on their interests about each others’ cultures. Spires sees many benefits to having students work this way. Spires’ goal for the physical design of the building is to support the type of teaching and learning that will take place in the school by bringing together the best principles of Chinese education, such as rigor, discipline, and Chinese cultural traditions, and the best of American education, including innovation and creativity, to create the foundation for the school. This is not Spires’ first foray into Chinese education. Inspired by Thomas Friedman’s book, The World is Flat, Spires traveled to China in 2007 with a delegation from NC State. From there she later connected with educators at the Beijing Royal School, where she, John Lee, Carl Young and others in the College of Education conducted the New Literacies Teacher Leader Institute at the school. The success of this work, Spires believes, ultimately led the Wuzhong Group to approach her and the Friday Institute for help with the new high school in Suzhou. Though the school is set to officially open its doors next fall, there is still a lot of work to be done. Spires will be relying on her colleagues both in China and at NC State to finish developing an innovative and effective curriculum. Dr. Karen Keene, an associate professor of mathematics education who previously worked on the MINDSET project at the Friday Institute, will assist with the mathematics portion of the curriculum. Dr. Teya Rutherford, assistant professor in Educational Psychology, is collaborating on the project by helping design the evaluation of student learning outcomes. Provide leadership for the development of a teaching, learning, and technology plan for the school. Provide consultation on the physical and technological design of the new facility to ensure that it supports contemporary teaching and learning systems. Provide ongoing training for educational staff in pedagogical approaches that support active learning. 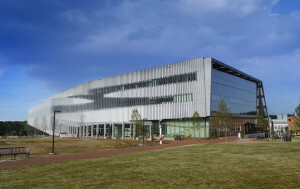 Create student and faculty academic exchanges between NC State University and SNA to expand the range and depth of global research and competence in both organizations. Working with Spires on this project are Erin Lyjak, project manager, and Marie Himes, curriculum specialist. Click here to watch a short video to learn more about the SNA project.